After months of waiting since the Season 7 finale chased Negan and the Saviors right out of Alexandria, AMC has released the first trailer for the eighth season of The Walking Dead. The trailer, seen in the video above, debuted to a packed Hall H and the San Diego Convention Center for San Diego Comic Con. On hand to present the trailer was a slew of talent from the AMC series, including showruner Scott Gimple, executive producer Greg Nicotero and Gale Anne Hurd, and cast members Andrew Lincoln, Jeffrey Dean Morgan, Melissa McBride, Alanna Masterson, Lauren Cohan, and Norman Reedus. The Walking Dead will premiere its first new episode since Season 7 ended in April this October. As fate would have it, the Season 8 premiere will also serve as the 100th overall episode of the series which began in 2010. With episode 100 will come the start of some major differences within the series. A common complaint from fans regarding the show's seventh season was that the AMC series slowed down its story in favor of extending the Negan storyline and delaying the inevitable war ahead. Season 8 looks like it will jump right in. 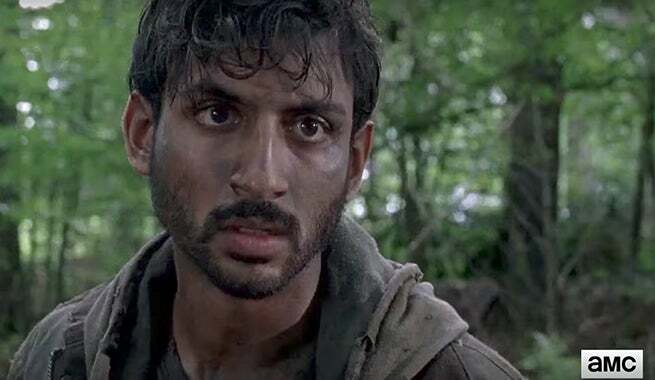 However, with this attempted launch of 100 more episodes and the All Out War storyline being adapted to television, the first look at the new batch of episodes came with some major callbacks and teases of things to come in the new season... Below, we break down each of those Easter eggs and teases, but this does mean spoiler from The Walking Dead comics and possibly TV series follow. 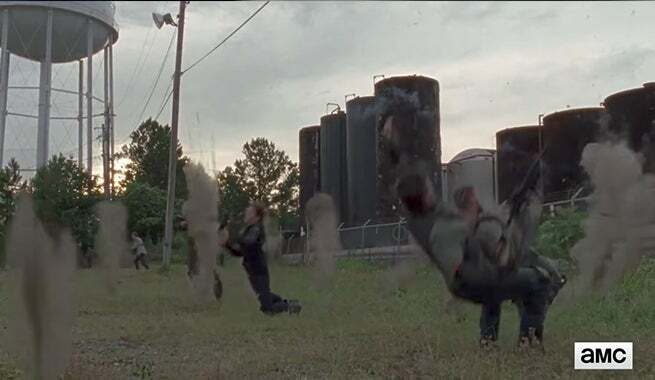 To kick off the trailer, shots of each of The Walking Dead's major characters flashed across the screen. The first after Rick was a glimpse of Carol and Tara sitting on a bridge high above a road swarmed with zombies. In the moment from the beginning of the trailer, Carol looks to her side at a piece of graffiti on the bridge's walls. She takes a second to look at a flower painted on it. This is a callback to several aspects of Carol's story. Not only did Daryl give Carol a Cherokee Rose flower when her daughter was missing in Season 2 but the reference goes back to one of the series' most unforgettable and heartbreaking moments. 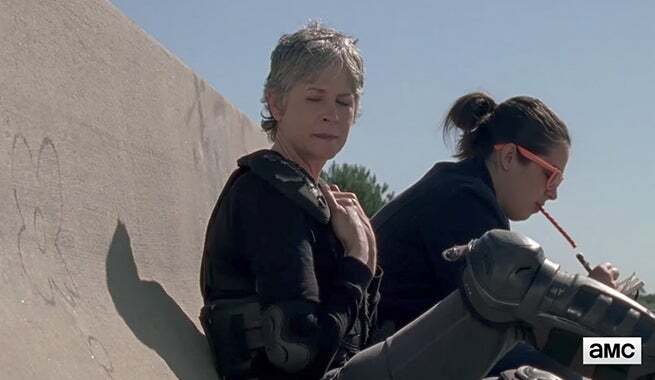 Carol had to shoot little girl Lizzie in the back of the head to protect everyone and while doing so, told her to "look at the flowers." In one shot, Dwight is seen in an unknown location unrolling a note. The ink on the note bleeds through the paper, giving us the opportunity to decipher it as reading, "Tomorrow." Dwight has attempted to align himself with Rick in the war to come and many are unsure whether or not the Savior can actually be trusted. It appears, however, that someone within the Alexandria Safe-Zone's team is choosing to alert him to their plans. 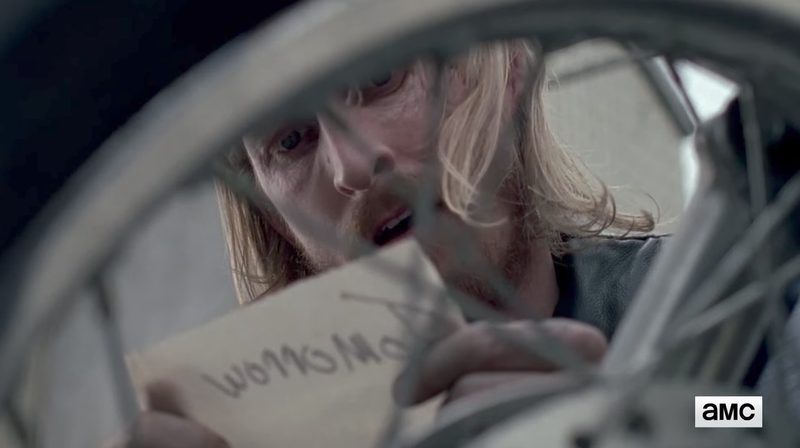 This is likely a note regarding war plans of some sort, giving Dwight either a warning or a plan to help execute. 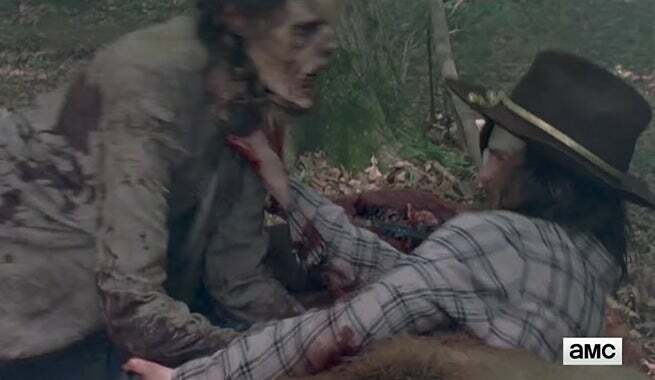 Following a shot of King Ezekiel's tiger Shiva being surrounded by zombies in the woods, there is a moment which sees Carl Grimes laying on a dead animal and taking on a zombie. The go-to assumption is that Carl is laying on Shiva's carcus. In The Walking Dead comics, Shiva is devoured by zombies during the All Out War storyline, sacrificing herself to save the king. It seems unlikely, however, that The Walking Dead's Season 8 trailer would give away such a major moment. Still, there is plenty of reason to be worried about both Carl And Shiva after the trailer reveals them to be in such dangerous positions. In The Walking Dead comics, several Kingdom soldiers and members of the Alexandria Safe-Zone are gunned down while attempting to take down one of the Savior outposts. In the shot photographed above, it looks as though a faction the Kingdom's army is being gunned down unexpectedly. In the comics, it is Richard and Eric who bow out during this moment. With Richard already dead, however, a character such as Daniel or Jerry could take his place. Eric, however, should be on the lookout for some bullets flying his way! Morgan uttered words no one ever should on The Walking Dead. "I don't die." In the photo above, Morgan appears ready for war, gun at hand, eager to kill some Saviors. His "all life is precious" creed has been tossed out the window. His mental state is questionable and he has little left to live for. It appears he is training Paul "Jesus" Rovia for fights and he has already built a prison for Rick to use one day. 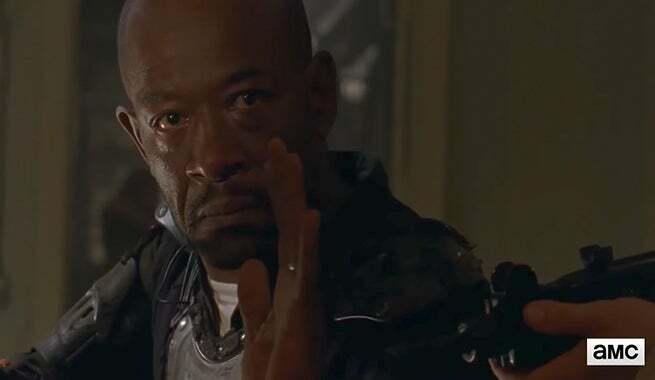 Running the risk of fading into the background of a crowded ensemble cast as The Walking Dead moves along, Morgan just might make his devastating exit during Season 8. According to a report earlier this year from TVLine, The Walking Dead put out a casting call for two new characters. The first was equated to the late Spencer Monroe while the second sounds more consistent based on this new cast member's appearance. "Abbud, an innately likable Muslim American whose nerves are, let’s say, jangled, because he’s flown solo for too long in zombieland," the report said. "Of the pair, the former is likelier to survive the looming conflict." The character might be a Muslim American but is also likely to have been traveling alone based on the appearance of his close and dirty face. Abbud is a character unique to television, though he will likely draw from one comic book counterpart or another. The first Muslim American character, Nabila, appeared on The Walking Dead late in the seventh season when King Ezekiel was approached by a woman within his Kingdom. While the possibility of Abbud belonging to any of the remaining communities exists, the safe bet is that he will call the diverse and prosperous Kingdom home. One possibility based on the comics is Abbud filling the role of Marcus, a Kingdom soldier, or even stepping in for the void left by Corey Hawkins' exit from the show as Heath in favor of 24: Legacy. In The Walking Dead comics, the All Out War storyline is followed by a massive time jump. The amount of time is never specified but it is estimated to be no shorter than two years and no longer than five years. In the time which passed, Rick Grimes took on a new look. His hair had been shortened and his beard grew full. 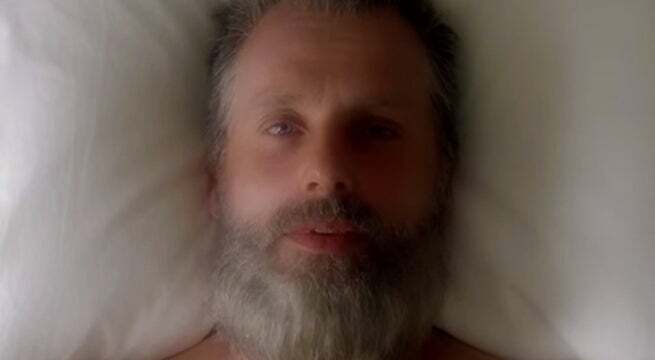 Unlike any time before it, Rick managed to maintain the look and keep it clean as Alexandria had finally began to show true signs of becoming a civilization. During Rick and Negan's final showdown in the comics, Rick wins the brawl but not without taking some serious damage. Negan breaks his leg. Without a hospital near by or proper way to recover from the injury, the damage to Rick's leg heals but never to one hundred percent. Instead, Rick walks with a cane for the rest of the comic. The first shot of the sequence tagged onto the end of The Walking Dead's Season 8 trailer sees a cane resting near Rick's bed. Fear the Walking Dead returns September 10. 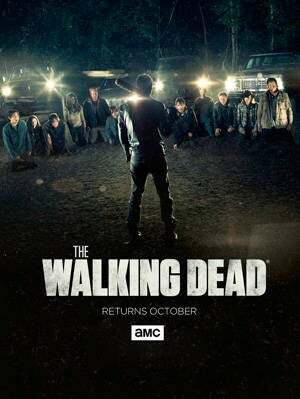 The Walking Dead will return for its eighth season in October with a trailer coming in July at San Diego Comic Con. For complete coverage and insider info all season long, follow @BrandonDavisBD on Twitter.